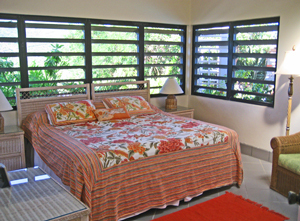 Soft Winds vacation rental sits on the top of a hill, on the point between St John's Fish Bay and Reef Bay. St. Croix, west to St. Thomas and north to the lush green hills of St. John. Enjoy both sunrise and sunset from one of the many decks. A perfect place to "get away" and enjoy total peace and complete privacy. Enjoy the hammock and ocean views from the main deck, or day dream in the hammock off the bedroom. Have an al fresco luncheon under the pavilion beside the pool. machine, and a full laundry. 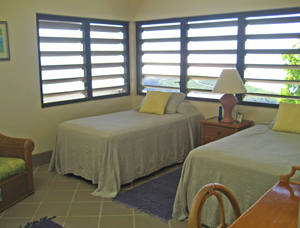 Soft Winds is fully screened and has ceiling fans in all rooms. The living room has sliding glass doors on both the west and east sides. St. Thomas with a sunset view. 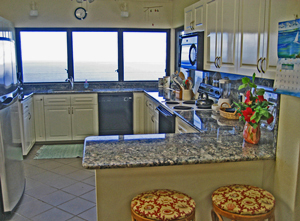 Soft Winds has a gourmet kitchen and is ideal for food preparation with lots and lots of granite counter space, electric range with oven, dishwasher, stainless refrigerator with ice maker, blender, toaster oven, microwave, coffee maker and a fantastic view too! A grill is located on the deck out the kitchen door. The main floor has three large bedrooms. 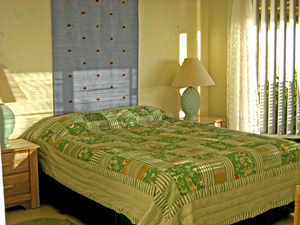 The master bedroom has a queen bed and a private bath and is adjacent to the kitchen. Two more bedrooms on the opposite end of the home and a fourth bedroom, on a lower level and is approached from an outside stairway. which share a full bathroom. The bedroom with a king bed has windows overlooking the pool deck, and has cable TV. The bedroom with the two twin beds can also be made up as a king bed. on a lower level and is approached from an outside stairway. Soft Winds is four miles from Cruz Bay center. Soft Winds sleeps eight comfortably.